Summertime is great for fresh and tasty salads! The best thing is, you can add everything you like or what you have left in stock. 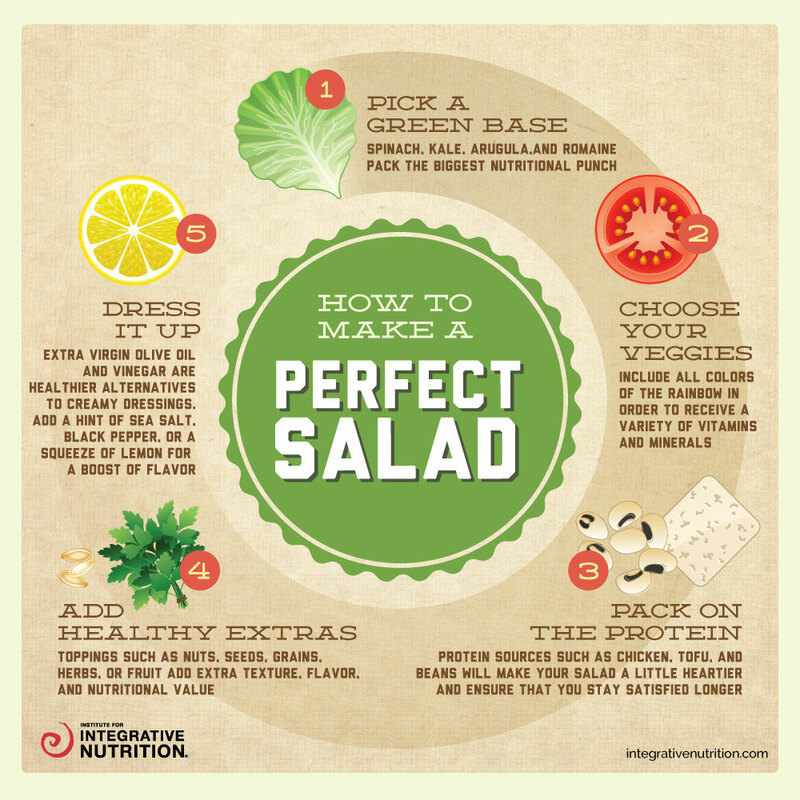 In just 5 simple steps you can create a delicious salad and give your healthiness a big boost! Leafy greens are high in vitamin K and mangaan, which are important for strenghtening the bones. And did you know that watercress, for example, contains more calcium than milk? Green veggies: such as broccoli, sellery, cucumber, avocado, paksoi and beans. Green veggies support and strenghten our bones and teeth. It’s said that green veggies have a positive influence to our eyesight and nerve system as well. Purple veggies (and fruits): such as eggplant, beetroots, grapes and figs. Purple fruits and veggies have a positive effect to our digestive system, the urinariy tract and the blood vessels. White veggies: such as onion, chicory and cauliflower. White veggies protect the blood vessels and have a positive effet to the cholesterol. Red veggies (and fruits): such as paprika, tomato and strawberries. Red fruits and veggies are high in lycopeen, which is a powerful anit-0xidant against cancer, heartdisease and cataract. Yellow and orange veggies (and fruits): such as pumpkin, paprika, oranges, tomatoes and carrots. Yelow and orange fruits and veggies have a positive effect to resistance and they provide many anti-oxidants agains cancer. Many orange fruits and veggies are high in beta-caroten which has a positive effect to our eyesight and skin. Some protein in your salad will give you a saturated feeling for some time! Besides that, proteins are essential for the recovery and strengethening of the muscles. Most sources for protein have a low Glycemic Index, which means they provide their energy slowly and gradualy. Add some extra flavour and texture to your salad! Cheese: Feta, Parmezan, Halloumi, Mozzarella. Why not try some goats cheese? Nuts and seeds: Nuts and seeds are great to add a little bite to your salads! for example; hazelnuts, pecans, walnuts, almonds, cashews, pumpkin seeds, sesame seeds, sunflower seeds, pinenuts (you can roast the nuts and seeds a little before adding them to your salad). Herbs: Fresh herbs are a great way to add even more green to your salad and they add a lot of flavour as well! For example: coriander, chive, parsley, mint, dille, etc. Of course you can add some pasta or grains to your salad as well! Go for the wholewheat pasta or experiment with millet, quinoa, rice, buckwheat, etc. A healthy and delicious dressing is easily made with only a few ingredients. The flavours of all your fresh ingredients pop up best with just some olive oil, vinegar, balsamic or some lemon juice! Experiment with adding some extra flavours such as a little orange juice, honey, mustard, dried herbs, garlic, ginger or chili. What’s your favorite salad-combo? Feel free to share your thoughts in the comments below! Posted in Background information, SaladTagged dinner, fit, food, healthy, healthy lifestyle, herbs, homemade, infographic, legumes, lunch, natural, nuts, recipe, salad, salade, seeds, vegetable, vegetables, veggie, veggiesBookmark the permalink.